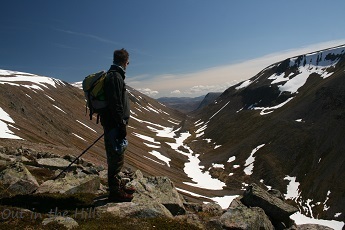 These walks can take us to several of the Cairngorm summits or deep into remote glens. The choice of route is at the discretion of the leader, and will depend on the group and the conditions on the day. Ben Macdui and Cairn Gorm - Ben Macdui is the second highest mountain in the UK after Ben Nevis, and has two distinct advantages: better weather, and it's much nicer (in my opinion!). This walk takes us across the airy Cairngorm plateau - we look down into the deep gash of the Lairig Ghru, and walk above the cliffs of Loch Avon, before heading back over the plateau to Cairn Gorm, the second Munro of the day, and the way down. 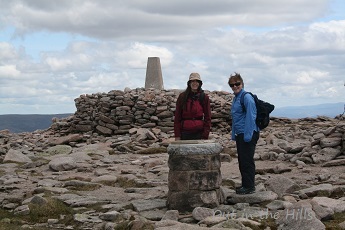 Bynack More - a straightforward but long walk to one of the quieter Cairngorm Munros. Chalamain Gap - through a rocky ravine and into the impressive gash of the Lairig Ghru, then back through the pine forests of Rothiemurchus and Glenmore, and alongside Loch Morlich. Sgòr Gaoith - look down from the cliffs of Sgòr Gaoith to Loch Einich far below.